What’s different with this IKEA kitchen island? Baskets are similar to drawers because they store lots of small items that can’t be stored on shelves; their main advantage is that they’re both accessible and removable. Fill the baskets with napkins, coasters and even cutlery or spices – later just pick them up and take them to where they’re needed. This IKEA kitchen island offers a cozy, warm look with the convenience of baskets that can be taken away and stored back in when they’re no longer in use. Update your IKEA kitchen by removing some cabinet doors. Open shelving is a hot design trend for cottage kitchens, although it does require that you display the cabinet contents attractively and keep them organized. Baskets, tins, and plastic bins offer affordable options for collecting like items into tidy containers that you can stash on a shelf. If the shelves are open, choose one kind of container for a clean, unified look. 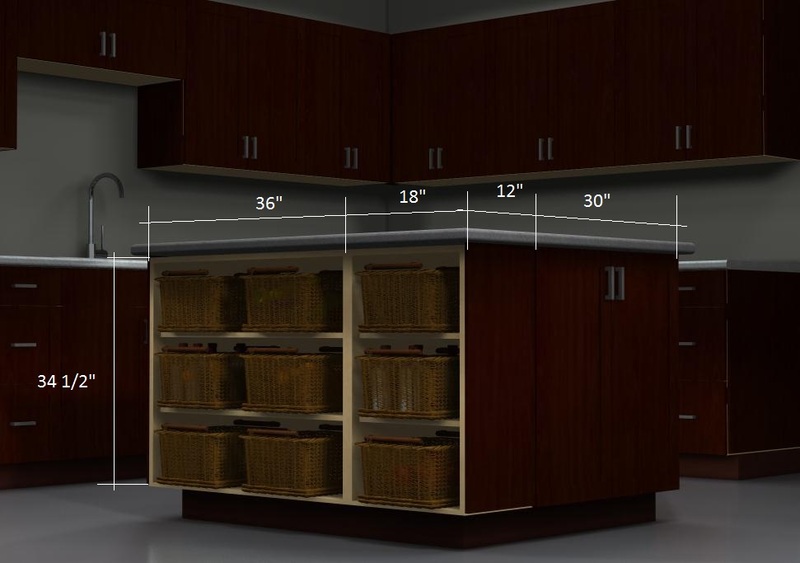 Open shelving can expand a room’s sense of space because your eye travels past the cabinet face, giving you the impression that the room has greater depth. The baskets adds cottage charm and it prevents visual clutter, too.